The Speaker of the US House of Representatives Nancy Pelosi warned the UK not to even "think about" a future trade agreement with the US if it undermines the Good Friday Agreement. A high-ranking group of US politicians, led by Ms Pelosi, is in Dublin for a two-day visit. 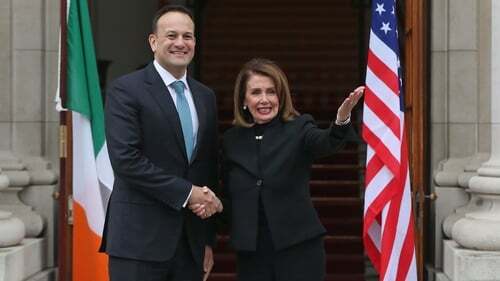 Ms Pelosi was met by Tánaiste and Minister for Foreign Affairs Simon Coveney at the Department of Foreign Affairs for her first official engagement and will meet Taoiseach Leo Varadkar later at Government Buildings. Speaking at a lunch hosted by Mr Coveney, she said the accord was more than just an agreement but was instead a value. Ms Pelosi said the US considers itself guarantors of the Agreement and this has been conveyed to "our friends" in the UK. She said it was special to be in Ireland at this time to mark both the 21st anniversary of the Good Friday Agreement and the Dáil centenary celebrations. US Congressman Richie Neal said the Good Friday Agreement was an extraordinary achievement and any retreat on that would be an awful mistake. The Congressional delegation is on a fact finding mission to Ireland. The delegation also held a meeting with Taoiseach Leo Varadkar at Government Buildings. Ms Pelosi is the third most powerful politician in the United States. Her visit is focused on learning more about the future of Ireland and the UK against the backdrop of Brexit. The Speaker is part of a delegation that includes several members of the Friends of Ireland caucus, including Mr Neal. Congressman Neal supported the now stalled E-3 Visa Bill, that would have introduced new US visas for Irish people. Mr Coveney also hosted a dinner in the GPO where there was cultural entertainment including music, dance and poetry. Tomorrow, Ms Pelsoi will address TDs, Senators and former politicians in the Dáil chamber, and later Mr Varadkar will host a dinner at Dublin Castle in honour of the delegation. The US politicians will also visit Northern Ireland over the next few days. Mr Varadkar has described the visit as evidence of the deep and historic ties between Ireland and the US. He said discussions with the delegation would focus on trade, visas, immigration and Brexit.